It's a story we first told you about four years ago…. Florida Lottery scratch-off tickets for sale after all the top prizes have been taken. I-Team Investigator Adam Walser has uncovered that even though the games have changed and payouts have increased, your chance of winning a top prize may not be as good as you think. Carlos Howard is on a lucky streak. He won $1 million playing a $20 scratch-off ticket at the Fletcher Avenue Quick Mart six weeks ago. “The only thing I know is I just kept playing, and if I win, I'll play it back,” Howard said. He said that up until recently, he never checked to see how many top prizes remained before buying a ticket. 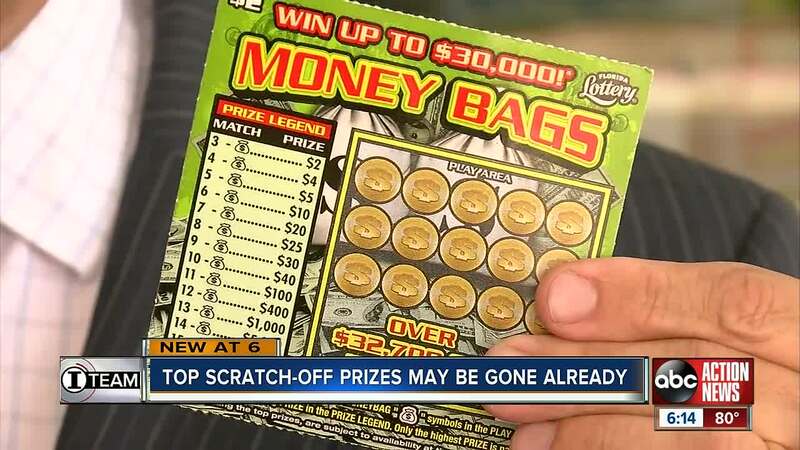 When the Money Bags scratch-off game first came out last May, the odds of winning the top prize of $30,000 was one in 2,400,000. But now the odds are zero, since all the top prizes have already been claimed. We discovered no top prizes remain for half-a-dozen scratch-off games currently being sold by the Florida Lottery. “You've got quite a few of them that's up here right now that already done been hit,” said Howard, pointing to a row of lottery tickets currently for sale. “It's not fair, because they say one thing and then it's another,” Howard said. .
Only about 20 percent of Florida scratch-off games currently being sold have more than half-of their top prizes remaining, even though they advertise jackpots up to $15 million. We showed lottery player Walter Duncan how to better his odds using information the lottery provides on its website. “I would buy something that would give me a better chance,” said Duncan. “The Florida Lottery encourages players to use the ‘Remaining Top Prizes’ page on our website as a reference. However, it’s important to note that the webpage does not list all of the remaining prizes—only the top prizes. Every ticket purchased always has a chance to be a winner,” the Florida Lottery said in a statement. Duncan says he'll keeping trying to hit the big one. See how many top prizes remain in Florida Lottery scratch off games here .